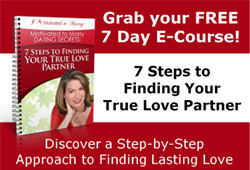 Are you at the point in your life that you are ready to seek a marriage partner? Do you envision yourself as a couple that is building a future together? And, perhaps also having a family with your partner? This can be a goal of yours even if you are 28 or 64! Yes, dating for marriage takes a special mindset and strategies beyond those who are just dating. Do you wonder why you end up in relationship with someone who is clearly not seeking marriage? And are you constantly disappointed to find yourself in relationships that don’t lead to engagement and then marriage? Last, do you want to get off the merry-go-round of dating people who turn out not to be marriage minded? 1. Not everyone you meet that you are attracted to is dating for marriage. The greatest heartbreak I see is that you meet someone who has real potential, however, they are not ready for a serious relationship that will lead to marriage. Their priorities are on their work, their kids or their independence. I remember when Karen came to me for coaching. She was 40 at that time, and desiring to settle down and start a family. She had been in a relationship with a man for 2 years. She had hoped this man and her would get married soon. He was a good guy and was there for her during some difficult times with her family. However, because of the coaching, she got the courage to have that important conversation about your goals in a relationship. What she found out was he was in no way interested in getting married and having a family. Of course she was disappointed, however, Karen was ready to move on and find someone more suited to her goals and dreams for marriage and a family life. 2. Dating for marriage requires a real sense of purpose. Within a month’s time Karen was ready to move on. It seems like when one door closes, another opens. When she met Rob, within a month’s time, she clearly expressed her intentions for a relationship leading to marriage and a family. Rob was on the same track even though he was a single Dad. They are now engaged to be married this coming summer. It’s important to be able to weed out those people who are not dating for marriage and easily determine who is. The Motivated to Marry Dating Secrets gives you the inside scoop on how to tell if someone is Motivated to Marry! 3. Dating for marriage requires you to have a timeframe in mind for engagement and marriage. There is a clear timing for relationships that depends on your age and goals. Dania was in her early 30’s when she met Seth, who was in his early 40s and divorced with no children. I recommended an event for Dania and she met Seth there. They hit if off right away and became officially exclusive within a month’s time. Within a year’s time, they were engaged and got married six months later. Daniel was in his early 40’s and motivated to marry and have a family. He had a clear timeframe in mind and when his girlfriend of 6 months started acting inconsistent because she knew Daniel had a timeframe, he ended the relationship and with my help, we got him back online, which worked best for him in meeting women, given his introverted nature. Then Daniel met his wife. He was open about his intentions for marriage and his desired timeframe for engagement, if all went well. She was on the same page. They were engaged with 3 months and married within 6 months. Last I heard, they are still happy together. 4. Dating for marriage requires you express your intentions early on BEFORE you become exclusive (and sexually intimate). Even for my clients who are in their 60’s and 70’s this works. The timeframe may differ, however, the intention is the same. Joseph was widowed and just turned 70. He really saw himself as getting married. Most of his friends were married and he truly wanted that close, committed relationship for golden years, to enjoy family life and travel. When he met Lynn, they both were on the same page about what they wanted in a relationship and they were very taken with one another. We worked on Joseph’s pacing so he didn’t fall too quickly for a woman (which he did on other occasions only to find these women weren’t really marriage material). Given this age group, marriage is not always the immediate goal, and many times a committed relationship is what works best. However, they did get married within 2 years of meeting after moving in with one another within a year’s time. Although it’s tempting to fall for someone who you have great attraction and chemistry, if your life goals are not the same, you are headed for disappointment and heartbreak. I’ve seen this time and time again. Through my Motivated to Marry Dating Secrets program, my clients get clear about their true goals and learn how to really ask for what they want early on in the dating process. As a result you are able to weed out those who are not ready to commit which saves you precious time and from great heartbreak. When you have done the deep work, (You know what you want in life, your key relationship values and who would make a good partner for you based upon your must haves), and you meet another marriage minded person who also has gone through an in-depth self evaluation, as well, then there is a recognition that they have found their match. It seems that the couples connect very quickly, and decide to be come exclusive within days or weeks. And then they get engaged within months or the year for those motivated to marry in the 35 to 55 year old age range. I have seen this for many of my clients and even true for when I was looking for a marriage partner in my late 30’s into my early 40’s. I worked with a coach when I turned 40 because I knew something I needed to do something different to improve my chances of meeting my marriage partner. My coach helped me shift some of my limiting beliefs and made sure that I kept true to my goals and life vision. Are you truly dating for marriage? If you met the right person tomorrow would you be reading and willing to put your time and attention to that relationship? Let’s talk about how the Motivated to Marry Program can give you the tools and strategies to have you successfully meet your marriage minded partner and have you ready to move your life forward as a couple ASAP. I Invite you to www.TalkwithCoachAmy.com to explore how coaching can make the difference in your dating for marriage. P.S. As a coach, I only work with “Motivated” individuals who are seeking a life partner and have a handful of sessions available this month. If you are ready to Meet Your Mate, then don’t delay complimentary strategy session to find out how we can get you on the right track for dating for marriage. Go to www.TalkwithCoachAmy.com if you are ready to move forward an meet your marriage partner (or looking for a serious, committed relationships) so you can have the loving relationship you dream of by this fall. ‹ When looking for a serious relationship, to hang out or not to hang out, that is the question!